Today we’ve got wedding invitations we printed for a couple’s (Joe & Melissa Masquelier) beautiful august wedding. The suite used lots of different elements to pull off the look that Joe and Melissa were looking for from wax seals and ribbons to mounting, envelope liners, and program fans. See all of the photos after the break and stay tuned for photos of their event to be posted shortly. In this photo you can see a lot of the pieces in the suite. 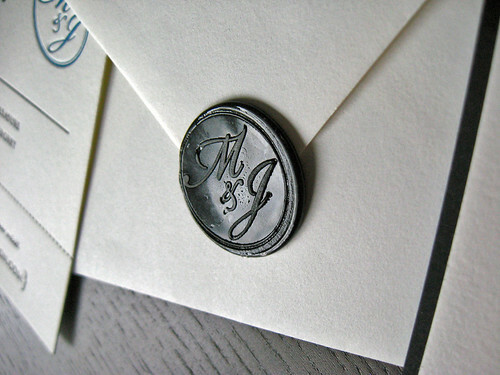 The invite was based on our Monogram wedding suite which is centered around a custom monogram. Letterpress pieces included an A7 invite, reply card with tear off registry card, and were paired with lined envelopes, A7 box, and custom wax seals. We also flat printed ceremony cards that doubled as fans (the perfect solution for a sunny California wedding). 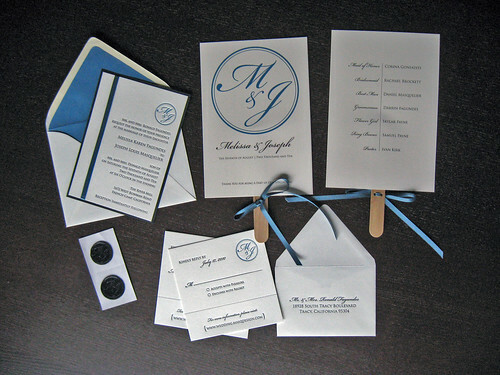 For more information on custom wedding invitations and announcements, email us at contact@dolcepress.com.